Anchored at the corner of Moncton and No. 1 Road in Richmond real estate market, the Mukai Steveston condos for sale offers a limited and boutique collection of luxurious new condominiums at the gateway of the idyllic Steveston Village. A landmark Richmond real estate development on this prominent corner, the new Steveston Mukai condos for sale features smart and sustainable interiors coupled with an architectural design preserving the character and deep roots of the Steveston Villlage community in Richmond real estate market place – a perfect combination of both modern amenities and a historic site that you can enjoy year round. The Mukai name actually comes from the Mukai Confectionery which was situated at the crossroads in the 1940’s, more than 70 years ago. The confectionery was owned by Miss Ano before she married Y. Mukai. Like the Mukai Confectionary, many ofhter stores owned by Japanese Canadians lined the main street of Steveston Richmond real estate community which serviced the farming and fishing industries during its hayday. Though times have changed dramatically, Steveston Village remains charming and natural and the Mukai Richmond condos is part of a welcoming modern day community with small town ambiance. The Richmond Mukai Steveston condos for sale offers conveience to all the local amenities and services that homebuyers look for, and is just steps away from the Steveston Village that we all love. Live at the Mukai Steveston condo building with the village just at your doorstep! Each new Richmond Mukai Residence embodies a wealth of modern detailing, finishing and fresh colour palettes that are professionally designed that all come together seamlessly to create a spectacular and indulgent living space for homebuyers and residents. Featuring high quality, environmentally friendly materials in addition to innovative, sustainable green design, Mukai Steveston condos for sale present healthy living spaces that are luxuriously comfortable. The open and flexible Richmond Mukai floor plans are spacious and the European inspired kitchens are spectacular. The modern aesthetics of the ensuite bathrooms make Mukai Steveston condo living a once in lifetime opportunity for Richmond homebuyers. Live at the Mukai Residences and experience its proximity to large urban parks, green spaces, shops and services and the great outdoors with its abundance of trails for biking, walking and the picturesque boardwalk and Steveston waterfront right at your doorstep. Live at the Mukai Richmond condos and relax by the water. Play in the local parks or celebrate during the fun and exciting Salmon Festival. The possibilities are endless here in Steveston Village Mukai Residences for sale. The Steveston real estate development at the boutique Richmond Mukai condos are built by Eclissi Developments Ltd. These quality built Mukai homes are spectacularly designed and crafted for today’s modern homebuyer. This is the reason for partnering with PECO Construction Ltd. In the construction and management of the Mukai Richmond condos for sale. With a thirty five year history in home building, PECO Construction is a company with deep roots in Vancouver and the Lower Mainland, specializing in custom built homes in prestigious neighbourhoods such as the Steveston Village Mukai Residences. Eclissi Development and PECO Construction also present the 2/5/10 Year National Home Warranty for all homes purchased. The Mukai Sales Centre is located at 12235 No 1 Road, Richmond, BC at the Re/Max Westcoast Steveston Real Estate office. Visit mukailiving.ca or call 604.274.7326 to check the latest availability and floor plans. An exclusive collection of just nine Richmond condominiums for sale located at 3900 Moncton Street in the heart of Steveston real estate market place is now under construction. These one bedroom, two bed and two plus den floor plans start from just $359,900. All of these Mukai Stevestone condominiums are spacious and some include balconies of more than three hundred and fifty square feet. More information about the new Richmond Mukai Steveston condos from the Re/Max Westcoast Steveston Real Estate presentation centre at 12235 No 1 Road. Visit stevestonrealestate.com today. Some of the incredible features include the location, obviously, centrally situated within the heart of the historic and quiet Steveston neighbourhood in addition to smart and sustainable interiors. There is innovative design and stylish finishes throughout with rich colour palettes that are professionally chosen. In addition, the Mukai Steveston condos for sale in the Richmond real estate market also features engineered hardwood flooring and wood windows, Grohe facuets in the kitchen and a high-end appliance package as standard features. The new Richmond Mukai Steveston condos also features a washer/dryer (in suite laundry) and a great location next to local amenities and services. This boutique Richmond BC real estate development at Mukai Steveston features only nine luxury river front condos in Steveston Village. As of early February 2010, there are only 5 units left for sale. The actual location of the property is at No. 1 Road and Moncton. The floor plans available at the boutique Richmond Mukai Steveston condos includes one, two and two bedroom plus den layouts. 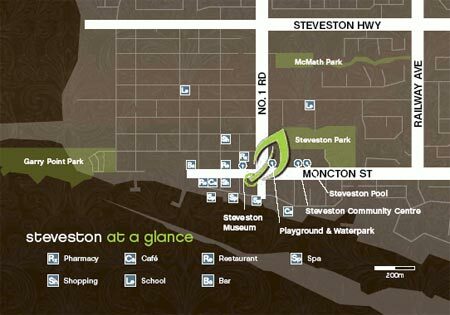 The price point for these presale Steveston Mukai condos start from the mid $300,000. Wood framed building with concrete perimeter, these freehold strata units have low maintenance strata fees and spacious living spaces. All homes at Mukai Richmond Steveston condos for sale will have parking in a garage setting. One of the two bedroom layouts has seven rooms and a total square footage of nine hundred and seventy five square feet, showcasing the spacious floorplans that are open concept and very functional.